MZILIKAZI High School in Bulawayo tasted the joy of winning the country's most prestigious schools football tournament, the Copa Coca-Cola, four times when they received a donation of books from the sponsors of the competition yesterday. 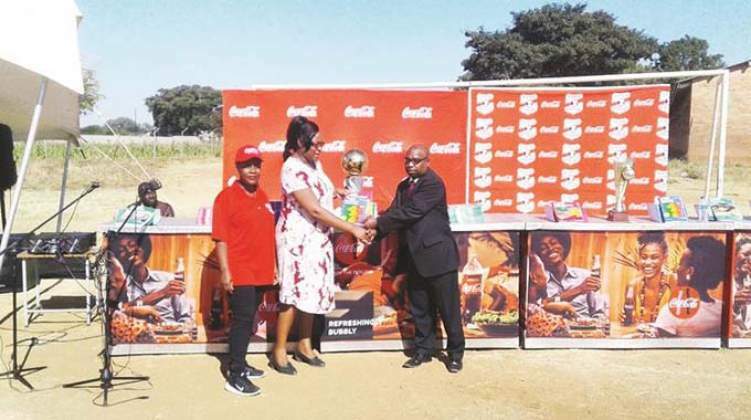 Coca-Cola senior brand manager, Vee Chibanda, handed over textbooks to the acting Bulawayo deputy provincial educational director (secondary and non-formal education) Thabani Sibanda and the school's headmaster Bhekokuhle Dube at a ceremony at the school. The winner's trophy was also paraded at the home of the inaugural winners of the boys competition in 1989 with Chibanda making a symbolic presentation to the Mzilikazi team of 2018. Chibanda said with Copa Coca-Cola in its 30th edition this year, it made sense to visit Mzilikazi, winners of the inaugural tournament in 1989. Mzilikazi defeated Manunure 3-0 in that final in 1989 at Gifford High School with their goals coming from Peter Ndlovu, Gift Banda and the late Benjamin Nkonjera. "We are here to talk about the journey that Coca-Cola has travelled for the past 30 years since 1989 we are now in our 30th edition. "As we celebrate this milestone, we have found it prudent to pay a courtesy call to your school. Mzilikazi High School is a special school where we trace our roots,'' Chibanda said. Chibanda said sport and education go hand-in-hand since football players need some form of schooling to be able to negotiate contracts. "As we celebrate Copa Coca-Cola@30, we do recognise schools that have done well in the tournament over the years and here today we are in Mzilikazi. "We shall also be going to honour other schools that are in the same space that Mzilikazi is, who have won the Copa tournament a couple of times,'' she said. The Mzilikazi headmaster expressed his gratitude to Coca-Cola for the textbook donation which he said will play a huge part in the school's efforts to implement the new curriculum. "We give sincere thanks to Coca-Cola Zimbabwe for sponsoring such an occasion in remembrance of the past 30 years as the official sponsors of Copa Coca-Cola Under-15 tournament. "These textbooks will go a long way in supporting the school's implementation of the new curriculum,'' Dube said. Yesterday's function was graced by Delta Beverages regional sales manager (south), Thembiso Muzvagwa, National Association of Secondary School Heads vice-president Arthur Maphosa, Nash head in charge of football Albert Mucheka, Nash Bulawayo leadership and former Mzilikazi headmaster Cuthbert Chiromo. Johannes Ngodzo and Castro Ndebele, winners of Copa Coca-Cola with Mzilikazi were also present at the occasion. From Mzilikazi, the Copa Coca-Cola trophy will be paraded at Hippo Valley and Churchill, who have also won the competition four times.